Discover how the frogs' delicate transparent skin both protects and threatens the species. It’s 9pm but it’s been dark for around 3 hours, and we’ve been trekking for nearly as long. By now, we’ve reached the Manu Learning Centre's (MLC) most undisturbed forest area, known to us as ‘chorro’, and are half way through our second survey transect - around 50 metres off trail. I match the pace of Juriko, one of the field staff members at Crees, who walks about a metre in front of me. We slowly scan the darkness, illuminated only by our head torches, looking for the amphibians and reptiles we’re here to study. “Rana! I have a frog!” she says in Spanglish as we all excitedly turn to look at where her finger is pointing. Our eyes adjust and we see it - a glass frog, almost entirely camouflaged against the green leaf it sits upon. We are excited for a number of reasons - not least about seeing the features that make this family of frogs so characteristic. This bright green frog is a cochranella nola, also known as a bell glass frog, a name which comes from their transparent stomachs (or venters) which reveal their internal organs. The chest of the cochranella nola is covered with a thin white tissue, leaving the lower belly transparent, meaning you can see the bottom section of its organs and the large vein which runs all the way down its ventral side. It is thought that glass frogs have evolved in this way so that when they are sitting on a leaf, illuminated from above, their silhouettes are less obvious to any potential predators below. It’s amazing to see, and when photographed, the translucency that helps protect this frog and exposes even the bones and tendons in its legs becomes more apparent. 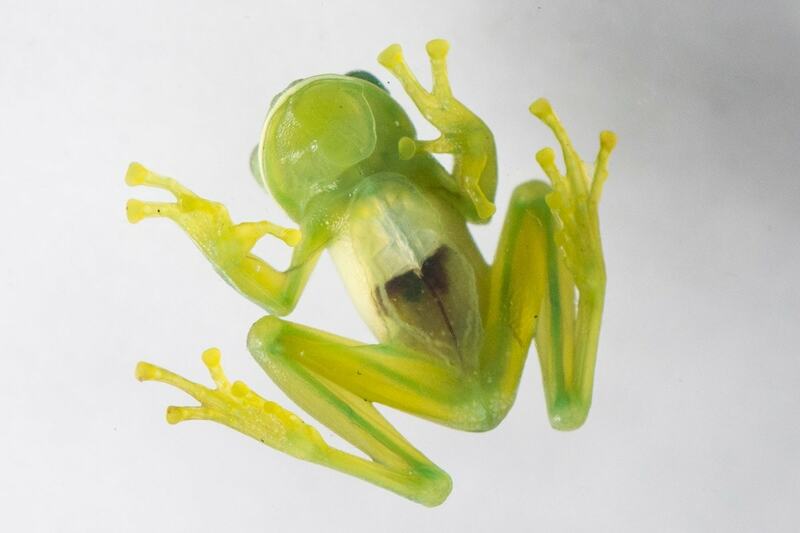 This fascination with glass frogs is not new at the MLC, and we’ve previously written about our love for this species and desire to see more of them. However, whilst its appearance is undeniably striking, our excitement to find them is also due to the impact their presence has on a regenerating forest like the MLC. Unfortunately, frogs are highly sensitive to changes in the environment. Because their skin is semi-permeable, they easily absorb any toxins present in the air and water, which is often fatal. As they have a range of habitats, such as in water, on ground level or higher up on trees and leaves, they are also a good indicator species for judging the health and potential biodiversity of an area. 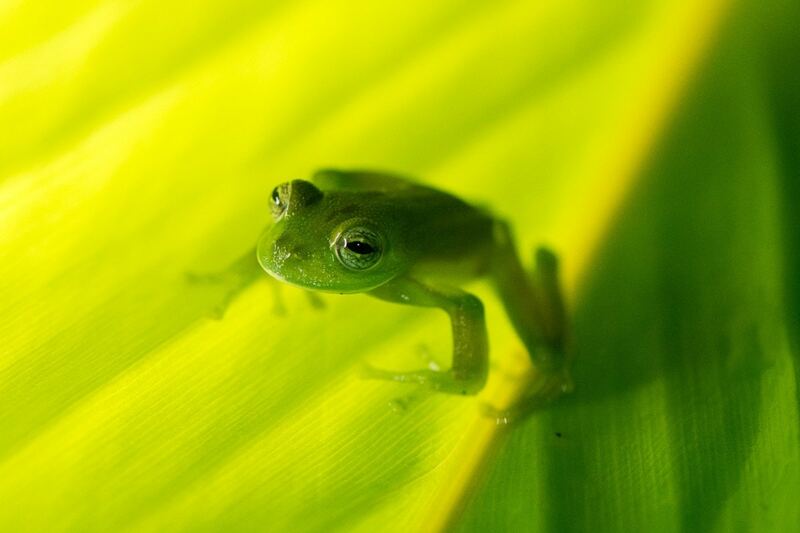 A third of the world’s frog population is thought to be threatened, and the glass bell frog has an IUCN status of near threatened and decreasing. Because the skin on its stomach is so thin, glass frogs are particularly sensitive to environmental changes. They also prefer areas with plenty of canopy cover due to the microclimate they provide, and so it is very unlikely to find them in a disturbed area. Therefore, to find a species like this anywhere should be considered special, but for those of us working in a regenerating rainforest, it is particularly significant. Over the past 5 years Crees has been carrying out a long term biodiversity monitoring programme to assess how certain indicator species, like these glass frogs, are responding to the regeneration of the MLC forest. As well as tracking ‘incidental sightings’ - those moments of joy when you spot wildlife in the rainforest outside of the species you’re specifically hoping to survey - we study amphibians and reptiles in two ways: visual encounter surveys (VES) at night and pitfall trapping during the day. These two methods aim to capture information on frogs who live in different habitat types, such as arboreal, semi-arboreal (i.e. on trees or leaves), terrestrial (on the ground) or fossorial (underground). 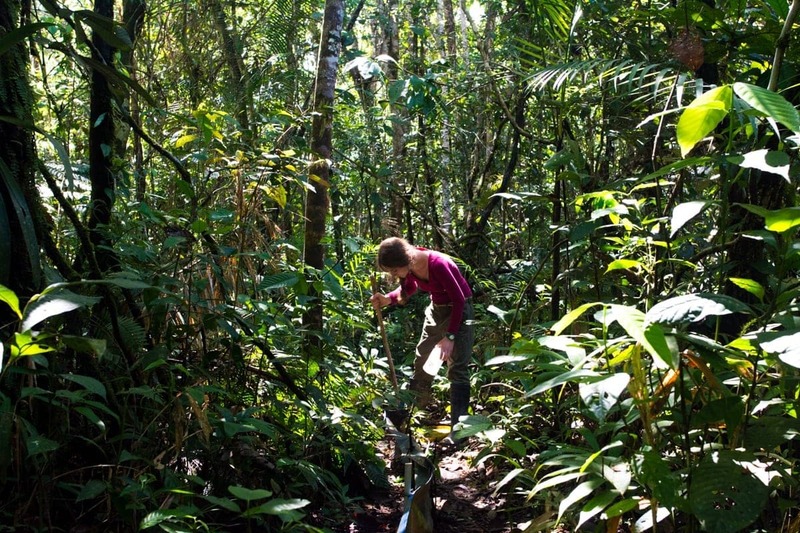 The knowledge gained from these projects has shown that the biodiversity of a regenerating rainforest can recover to as high as 87% of that of a primary, undisturbed forest (including 88% of species of highest conservation concern). It has also helped contribute to our field guide, Amphibians of the Manu Learning Centre, which you can download for free. Our conservation projects are hands on and can take volunteers, interns and field staff alike into the middle of the jungle in the middle of the night. But our everyday wildlife encounters with the incredible species of the Peruvian Amazon like this stunning glass frog make the sweaty, long days worth it - every time.